Extreme western district of the Austrian empire. In the Middle Ages it was called "Vor dem Arlberg," and was divided into the estates of Bregenz, Feldkirch, and Bludenz. To these was added in 1560 the imperial county of Hohenems. The first three districts were held by the counts of Montfort-Werdenberg, but gradually came under Austrian control. 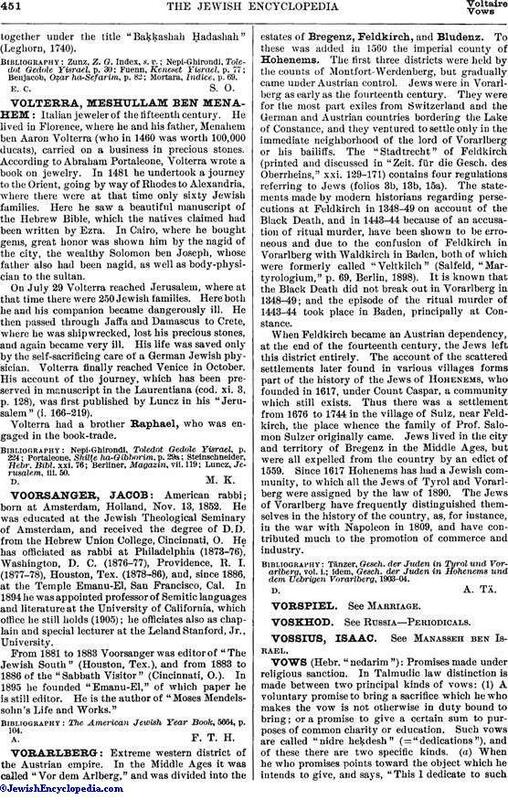 Jews were in Vorarlberg as early as the fourteenth century. They were for the most part exiles from Switzerland and the German and Austrian countries bordering the Lake of Constance, and they ventured to settle only in the immediate neighborhood of the lord of Vorarlberg or his bailiffs. The "Stadtrecht" of Feldkirch (printed and discussed in "Zeit. für die Gesch. des Oberrheins," xxi. 129-171) contains four regulations referring to Jews (folios 3b, 13b, 15a). The statements made by modern historians regarding persecutions at Feldkirch in 1348-49 on account of the Black Death, and in 1443-44 because of an accusation of ritual murder, have been shown to be erroneous and due to the confusion of Feldkirch in Vorarlberg with Waldkirch in Baden, both of which were formerly called "Veltkilch" (Salfeld, "Martyrologium," p. 69, Berlin, 1898). It is known that the Black Death did not break out in Vorarlberg in 1348-49; and the episode of the ritual murder of 1443-44 took place in Baden, principally at Constance. When Feldkirch became an Austrian dependency, at the end of the fourteenth century, the Jews left this district entirely. The account of the scattered settlements later found in various villages forms part of the history of the Jews of Hohenems, who founded in 1617, under Count Caspar, a community which still exists. Thus there was a settlement from 1676 to 1744 in the village of Sulz, near Feldkirch, the place whence the family of Prof. Salomon Sulzer originally came. Jews lived in the city and territory of Bregenz in the Middle Ages, but were all expelled from the country by an edict of 1559. Since 1617 Hohenems has had a Jewish community, to which all the Jews of Tyrol and Vorarlberg were assigned by the law of 1890. The Jews of Vorarlberg have frequently distinguished themselves in the history of the country, as, for instance, in the war with Napoleon in 1809, and have contributed much to the promotion of commerce and industry. idem, Gesch. der Juden in Hohenems und dem Uebrigen Vorarlberg, 1903-04.